I’ve seen lots of beautiful designer pillows on the net that I would love — lots of gorgeous colours & patterns that cost lots of bucks. Usually I pay $5-10 for decorative pillows, but . 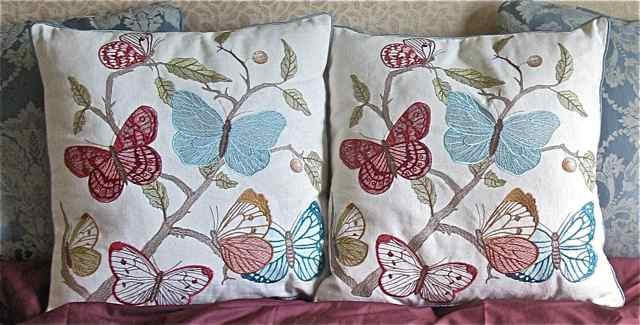 . .
My new butterfly pillows from Bombay — aren’t they gorgeous? While on my way to my usual go-to store for quality linens at discount prices [Quilts, etc. ], I noticed a new store — ooh, a Bombay has opened up & wow, they’re celebrating with 40% off practically everything. Of course, my bank balance was nowhere near surviving a shopping spree of everything I loved, but maybe a little treat, . . . for me. My original goal was a duvet cover so I went next door & found the only Queen size on sale for $25. Although originally looking for blue, it seemed like fate that it was a lovely deep red — a perfect match to those wonderful butterfly pillows next door. I debated a little–a very little–then, yes, even with 40% off $39, I paid almost as much for ONE pillow [$23.40] as I did for the duvet cover — almost $47 for the pair! The red & turquoise butterflies tie all the bedroom colours together — specifically the glass colours in the headboard, tables, & shutters. I LOVE ’em! Along with a new $10 mohair throw, I not only refreshed my bed but also brought in some great designer style — all for less than $100 [including those damn taxes]. With the bed prettied up, I was inspired to do more with the side tables. While shopping, I had picked up a few fresh flowers [no, I’m not willing to cut my blooming tulips outside!] 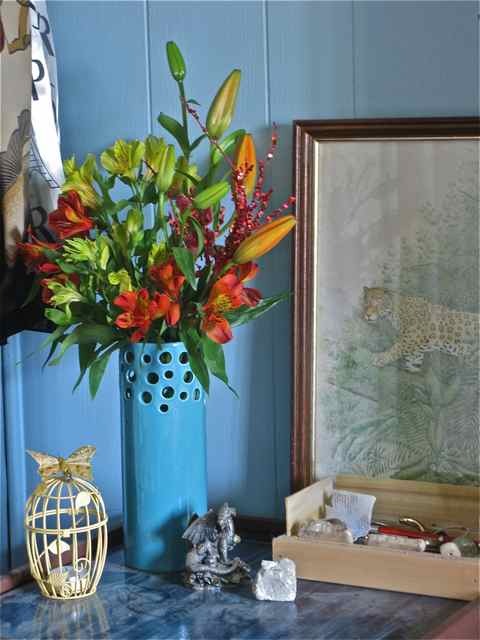 — $6.97 got me enough for both turquoise vases. Each vase has a glittery branch with butterflies — can you see it? Hint: one is red & the other is turquoise. I’d been eyeing some little bird cages online for $9.99 & then saw these at Michaels — my kind of bargain at $2.99. That’s a big yahoo for shopping local. 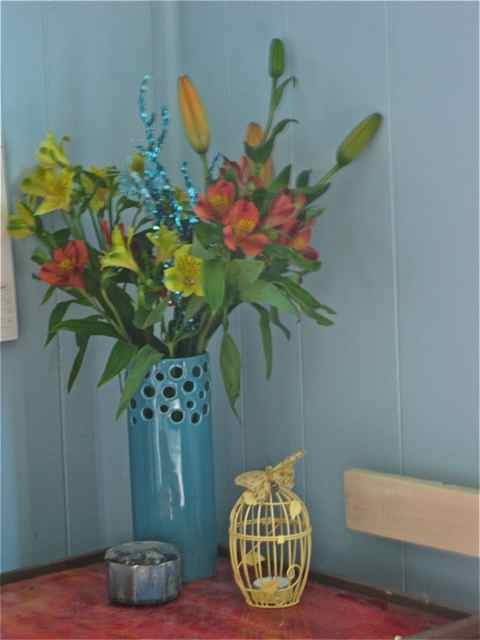 Although I was looking for turquoise or blue butterflies, these feathery yellow ones were on sale at $2.99 [for 3] & actually look perfect on the yellow cages. Of course, as soon as I got home, I kicked myself for not picking up more of these little bird cage beauties for other decorative vignettes — they add wonderful colour & texture with a lovely airyness. The bed at night — with the headboard lights on & the tea light candles in the bird cages lit. 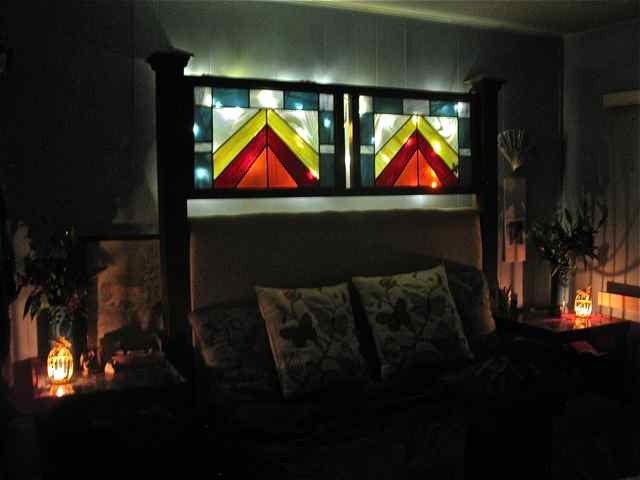 For previous posts on making the bed [Project 7], see Raising the Sun Victoria Style and Christmas Lights Update Romantic Headboard. Lovely pillows and the stained glass is beautiful! 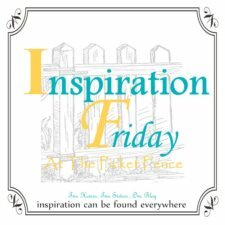 Thank you for sharing your creativity at Potpourri Friday!